Kids take home their very own unique handmade bracelet! Includes all materials and expert and caring help from staff. We adapt the class to age and skill level! Cake, balloons and pizza available upon request. Up to 8 kids for only $250! Each additional child is $25, maximum 20 kids. Our party package is wonderful – Your child and her guests will be entertained with 1 and 1/2 hours of fun and creativity! The first part of the party is jewelry making and the second part is for pizza, cake, refreshments and celebration. We provide thousands of beautiful beads and charms to choose from, all the materials they need and guided instruction from our experienced and caring staff. The birthday girl can choose an extra charm for her bracelet and will go home with a $5 gift certificate! We also provide colorful party banners and decorations, all free of charge. The price for this party package is only $250 for 8 guests and $25 each additional guest. We can accommodate up to 20 children. If you would like, we are also happy to provide 2 fresh hot pizzas, juice and water bottles. Each attendee will be served with colorful party placemats, plates and napkins, all for only $50! Birthday cake or cupcakes can also be arranged! 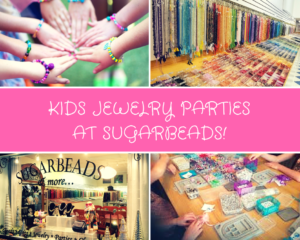 Come celebrate at Sugarbeads and make memories that will last forever! Call us at 203-431-6655 to reserve a spot!